Here are two wavy jades. Obvious differences, yet both wavy...Any ideas as to cultivars for these? I'm sure someone more experienced can help you with your question. I was wondering if you can root the wavy jades from leaves or do you need a cutting? Interesting & cool-looking plants. Without knowing they're supposed to look like that, I would think there's something wrong with them. Sorry, this isn't a bit helpful. I see names such as 'Blue Bird,' 'Whirly Bird,' 'Whirlybird,' and 'Ripple Jade' by some sellers. curled under at the tip, not necessarily wavy to my eye. Are the leaves firm, well-watered? I was sort of thinking 'Bluebird' for the one on the left as well, thanks for the confirmation. I was meaning does it grow true from a leaf? I know that a variegated jade reverts back to a plain jade when rooted from a leaf and stays a variegated jade when rooted from a cutting. but the tendency is, indeed, to revert. 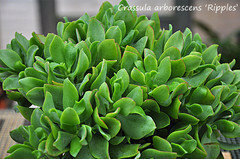 Norma knows all about Crassula ovata 'Waves,' apparently. Have you been able to contact her? If that's what she says it is, I'd assume she's correct. 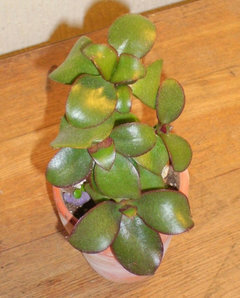 Good question, I have not tried with wavy jade, but tried with my 'Gollum' type, and the tiny plant did not revert. I was just wondering what the parentage of 'Waves' is compared to the 'Bluebird.' I haven't seen Norma on the forums for quite some time, by the way. That I couldn't tell ya, unfortunately. Maybe Glen knows something about these varieties. I'll ask him, if he doesn't see this Thread first. As for Norma, I see her on facebook fairly often. "Unhealthy" wouldn't cross my mind looking at this new pic. What a cute plant!!!! What size pot is that? Don't know if this is the same as has been discussed on this thread but this is one I picked up this past spring at a Big Box store for dirt cheap. So far it hasn't done much but grow. I was hoping for flowers and left it out in the cold and short days for some time but no flowers. Some names I've seen are C. ovata v. undulatifolia. I think "Ripple" is just this vendors take on the same thing.... a selling tactic to get us to purchase lots of the same thing listed differently.... maybe???? So the one bikerdoc posted looks like the plant on the left in my first photo. So is it arborescens or ovata? Maybe the one on the left is arborescens, and the one on the right is ovata? Very nice plants! The one on the left has unique color! Confusing little buggers too! LOL! 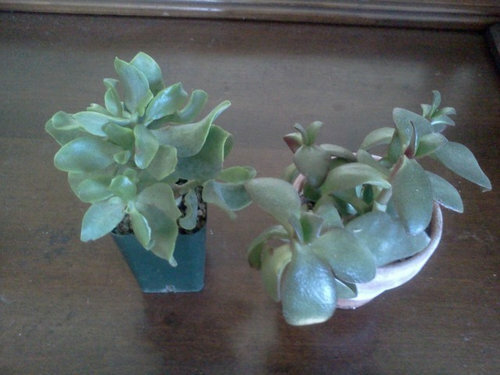 I have one that has the same shape leaves as the one on the left, and it came from Arid lands. Also called 'arborescens', so I'm guessing that has something to do with the wavy leaf. I have linked it below, it's the 3rd plant down. but I don't know what the final nomenclature should be. so am I right that 'arborescens' has something to do with 'wavy'? Boy these little plants get confusing. lol..
See! Confusing little buggers! LOL! So is 'ovata' in reference to the oval leaves, but bushy jade? This may be helpful... then again maybe not. 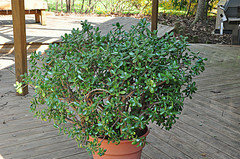 Crassula ovata, also known as C. argentea, C. portulaca and/or C. obliqua, is the jade many of us grow with the nice green leaves as pictured below. There are many cultivars or hybrids like 'Hummel's Sunset' etc. Then there is Crassula arborescens or "Silver Dollar Jade" because it has large "obovate to orbicular, 20-30(-40) mm broad, carnose, somewhat convex on both surfaces, red margins and red spots above, glaucous" blue-green leaves. There are two subspecies of this: C. arborescens ssp arborescens and C. arborescens ssp undulatifolia because it has more wavy leaves but still has the blue-green coloration and a different flowering time. the Latin word 'ovate' means egg-shaped (ovum), so yes it does refer to the oval leaves. Sorry Bikerdoc, nothing new to me, anyway, about ovata and aborescens, but I would mention that not too long ago, aborescens was more prevalent than ovata, (I have older books about succulents that mention arborescens but don't even mention ovata, or the older name, argentea) but now, at least in my corner of the world, aborescens is hard to find, but ovata, in many forms, is everywhere. So until I get confirmation to the contrary, in my limited view, the plant on the left is hybrid of arborescens, while the one on the right is hybrid of ovata. 200 Year Old Home; Curb Appeal? 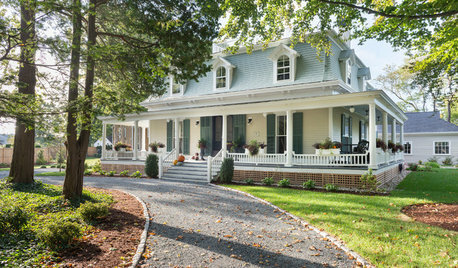 Exterior paint recommendations for a Victorian style home. Did I poison my plants? What's this white stuff on the stem of my Chinese Money Plant? Aluminum Asphalt Lute Rake, Brace Reinforcement, 6' Handle, 36"